Sometime in the next few years, a new institution will open in Delaware. Despite the New York Times and Boston Globe‘s pearl-clutching angst about the supposed devastating social impact of deinstitutionalization and lack of desire to consider newer, better, cleaner asylums. This institution, like many similar ones cropping up mostly unnoticed outside disabled activism in the past several years, claims to be an “intentional community of choice” offering people with disabilities more options for housing with supports in place that they might need. That rhetoric is extremely misleading at best, and outright dangerous at worst. It completely twists the meaning of the word “choice” beyond all recognition, to an extent that should make any English teacher cringe in shame. Over the past several years, I’ve been working on policy advocacy around a set of federal regulations known as the Medicaid Home and Community-Based Services Rule. This is better known as HCBS or the “community rule” for short. The point of the community rule is to establish specific rules about what kinds of living situations are institutions, or so institutional they’re basically the same thing), and what kinds are not, so that only the housing and residential services that aren’t institutions can get HCBS funding. In looking to identify patterns of institutions that claim to be community based and focused on choice while actually being restrictive, coercive, and institutional, I noticed a disturbing trend among autism parents. These folks, and other non-disabled family members of developmentally disabled adults are pushing advocacy and fundraising for whole villages, gated communities, campuses, farms, and ranches as medium to large scale housing schemes for autistic and other disabled adults. These parents claim that their children (who are often actually adults) would actually want to live in a group setting with other disabled adults receiving a high level of support in home, and that to insist that everyone can live independently in their own apartment or house is actually denying their children the right to choice. The most recent installment in this saga is a new institution to be funded by the Ford Foundation, which along with its grantee, Homes for Life Foundation, praises this project as a wonderful opportunity offering a real choice for disabled adults and an alternative to the “restrictive” interpretations of the famed Olmstead v. L.C. community integration mandate from 1999. The document outlining the new project even quotes autistic activist and artist Judy Endow describing the importance of being among other autistic people in an attempt to show support for segregated settings. It notes the devastatingly high numbers of developmentally disabled and other disabled people who are locked up in jails and prisons. And it discusses in depth the idea of many disabled people wanting to live around other disabled people, and how that should not be stigmatized or removed as an option. Here are the real issues though: These types of projects take the meaning of “choice” and “autonomy” and upend them. Of course, many disabled people would want to choose to live in a group with mainly or entirely other disabled people, perhaps even on a farm or ranch. Of course, many disabled people might need or want to receive in-home supports to manage daily life. Of course, disabled people should have the ability to make meaningful choices about where we want and choose to live. Of course, disabled people should not be dumped into supposedly “integrated” apartments without the supports we need and want, or warehoused in jails and prisons when we fail to get by without the supports we need and want. But when disabled people seek to create intentional community, centered around shared disabled experiences, mutual support, interdependence, and group living, we need to be in control of our own lives and in control of the supports we are receiving. These projects, almost entirely funded by non-disabled family members and foundations representing those folks, do not proposed creating villages, intentional communities, gated communities, campuses, etc. where the disabled residents would actually control their living situations. They accept at face value the reality that some disabled people would prefer a group living situation, and assume that so long as that is provided, everything would work out. For a group living situation to be meaningfully chosen and to actually respect autonomy, choice, and dignity, the disabled people living there have to have the ability to opt in and to opt out at any time. They have to have control over which staff are hired and fired, as well as over which services and supports they individually receive or decline. They must have the legally and meaningfully recognized ability to change their minds. They must have control over how many roommates and housemates they have, and who those people are. They must have control over the entire vision and direction of the community at all times. Most importantly, they have to have the ability to decide whether, and when, to leave, if they choose to do so. This project through Homes for Life instead horrifyingly takes a prominent autistic activist’s words and uses them to try to claim that this group living situation – an institution, no doubt – is actually an intentional community. The reality is that it’s intentional, but via design meant to assuage ableist fears of non-disabled family members of disabled people – not via design meant to create a loving and conscious community led by and for disabled people. In my work on the HCBS community rule, I investigated several such campuses. I found that even if they are not directly physically abusive, they still end up isolating disabled residents by making them reliant on staff to do everything, stigmatizing them by bringing them “into the community” only in groups that are obviously from the disability-specific residence, and not enabling individual residents to make meaningful choices about either their everyday lives or the arc of their lives on the larger scale. There is a huge difference between disabled people choosing to associate and live alongside other disabled people. Pressuring disabled people to live in disability-specific, segregated, and isolating environments with little to no control over any aspect of our lives. The “intentional community” here is cringe-worthy not only because it promotes a particularly insidious kind of institution (the kind that looks nicer and sounds better – something that Mel Baggs has famously written about in hir blog), but because it’s part of Ford Foundation’s long history of trying to fund social justice movements into more conservative and regressive directions. Several decades ago, Ford Foundation was a major funder of Bruno Bettelheim’s infamous work on the refrigerator mother theory of autism. Bettelheim claimed that autism was caused by cold, emotionally distant mothers whose children recoiled and withdrew from their lack of affection. I would have hoped they might have learned and done better, but now they’ve decided to accept the reasoning that creepy, institutional villages masquerading as “choice” are worthy of funding and support. As many of us will tell you, criticism of large-scale disability-specific residences designed by non-disabled people is not only the province of disabled people who can write articles or go to college. It’s also rooted in the historical self-advocacy movement pioneered by such luminaries as Bernard Carabello who survived 18 years in Willowbrook. That self-advocacy movement continues to be led primarily by and for people with intellectual disabilities, who can perfectly well speak for themselves even and maybe especially when non-disabled people refuse to listen. For those of us who went to college (whether or not we also have intellectual disabilities) and write articles, I can assure you that those traits don’t automatically come with other skills or abilities – that’s why we’re still disabled. It’s true that no one of us can actually speak for every other disabled person, but, we can point out the importance of listening to disabled people, and listening to our words in context, when thinking about whose perspectives are most important in funding disability-related housing initiatives. 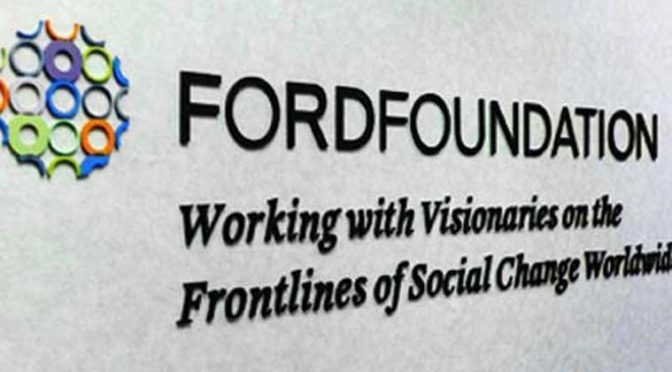 Today, the Ford Foundation has decided to support a project that claims to be offering choice for disabled people without involving any actual disabled people in crafting its proposal. And not only that, but a project where one of the document authors is known for advocating for electroshock therapy on autistic children to make them more “compliant.” This is even more profoundly disappointing after a statement last year from Ford Foundation’s president Darren Walker on the importance of addressing disability discrimination in their civil rights portfolio – including by recognizing that the foundation has zero people with apparent disabilities on its board of directors. The Ford Foundation could do far better than another institution and a report written about us without us. They might start, for instance, by funding the ground-breaking work at the Bazelon Center for Mental Health Law in challenging institutionalization of people with mental disabilities, and the impact of mass incarceration and the school-to-prison pipeline on students with disabilities. They might grant money to groups like HEARD, which has long fought for Deaf and disabled incarcerated and returned individuals, or they might grant money to disabled folks doing work on the ground in local communities, who are often not organized into 501(c)(3) nonprofit organizations, but who are working to create actually intentional communities chosen and controlled by the people who intend to live in them. The trend of funding something “innovative” by supporting institutions and listening to non-disabled people over us should be long since buried in the past. Thank you for speaking truth. I have been tracking Homes for Life’s efforts in creating this institution for many years. They have solicited other “guardians” to join them in their persecution of all those that disagree with their methods of segregating. I am one of those “advocates” with disabilities that they have publicly admonished. One of their members demanded I “step down” from whatever position I have. They claim their own family members with disabilities cannot speak for themselves, yet they also claim their family members want to live only with others with the same disability. As for those without guardians or confinement? HFL claims they don’t qualify to speak on behalf of people with disabilities. The Homes for Life Foundation is undertaking critically important work to expand choice-driven supported housing options for adults with developmental disabilities. A congregate option that provides necessary amenities and supports appropriate for an individual with intensive or high needs is clearly a good thing, so long as that individual wishes to reside there and is not restricted from engaging with the larger community. Homes for Life’s concept is based both on freedom to chose (it’s a zero coercion model) and complete freedom to integrate with the larger community. Why would anyone want to deny an adult with I/DD the supports he or she needs? The Ford Foundation and its supporters are completely misguided on this. There is nothing an institution can do that cannot be done better in the community in real homes with funding for needed supports. No adult with developmental disabilities “needs” an institution – they will be less safe and by design, less connected to family and community. When resources are concentrated in large buildings and institutional infrastructure, there is less choice for everyone – for decades to come. These lessons were learned decades ago. The US courts have spoken. The UN Convention on the Rights of Persons with Disabilities Article 19 is clear on The Right to Live in the Community. Fight for community based supports, not for the re-creation of the human warehouses of the past. How do you assess whether someone wants to live there? Hi, this is your friendly neighborhood moderator. Please respond to other commentators respectfully or I will ban you. I think you assess the same way you do any choice made by a resident (or guardian): you ask the person. They will tell you. What am I missing here? Many that claim to be the guardians, speak and decide for the person with a disability including, where they want to live. The history of large congregate settings is decidedly not of being able to abide by this crucial factor. As an NT who shares your writing often, this article is disappointing and makes quite a few incorrect assumptions. The biggest mistake is making the assumption that this intentional community would be a provider-owned/controlled setting, it is not. I authored the feasibility of using HCBS supports in this proposed intentional community. The intentional community being planned seeks to be consumer-controlled, thus any resident would have the choice to hire or fire whatever provider they like and decide to leave at anytime. It’s just housing, not group homes. Unfortunately, as described in the section I wrote, Delaware DOES NOT ALLOW anyone with support needs of more than 40hrs a week to live in a home of their own, but FORCES them into provider-controlled settings! Therefore, even if this setting wanted to be consumer-controlled, any person who needs more than 40hrs a week of support would be excluded unless a home is rented to a provider to be a provider-controlled group home. It is the service delivery model that removes control and stability of housing from waiver recipients, not whether they live next to neurodivergent neighbors. The importance of providing access to consumer-controlled, affordable, accessible housing in any form can not be understated. If people can not afford rent, they are forced into provider-controlled settings: group homes, adult foster care, institutions, nursing homes, etc. Investment in consumer-controlled, affordable, accessible housing should not be restricted nor stigmatized simply because the community seeks to be intentionally neurodiverse. I welcome further discussion as the clock is ticking for over 1 million neurodivergent citizens who have had no choice but to live and be supported by family who are now over 60 years old… they must have access to OPTIONS not just the next empty bed when their parents die. Do you see those laws as inevitable? Why not join advocacy efforts to change them? Why not change the model, then, instead of creating new congregate settings? I’m also skeptical about the meaningful opportunities for community integration in a congregate setting based on past advocacy experience because the legal right to leave is often limited by practical concerns if not outright illegal actions by staff. Even in the former circumstances, where is this program located? If, like many large congregate settings, it’s located in a remote area without transit or pedestrian access to more populated parts of the area, the legal right to leave has little practical effect. Similarly, if transportation to self-directed activities in the community is dependent on staff driving residents somewhere, that at very least reduces the opportunity for people to create their own schedules, and often means that community-based activities will be limited to the extent that it’s convenient to staff. Thanks for your response and good to know you are staying abreast of the latest articles. I’m curious who they writer is. Is she a family member, a journalist or professional writer, or? I agree her position made some outright assumptions but also inferred rights that nobody has. For example if I live in an apartment, I have no right to hire or fire an apartment manager or groundskeeper. However I would have every right to report any misconduct or suspected abuse. Please read it all the way through. It obviously was written in response to the political divisiveness happening these days. But it applies to all the topics that people get emotionally attached to… Like the well being of their children …. Like protecting vulnerable folks from abuse…. Like giving people the opportunity to choose how they want to live. We know from horrific past experience decades ago that we don’t want to stick people in a setting where they are not treated as humans. Yet, I don’t think anyone has produced the enduring solution to the issue of housing for people that experience disabilities. Personally, I suspect it is so complicated it will take time and lots of pilot projects to evolve. And more than likely many different settings are needed to satisfy the many interests and needs of our loved ones. So I hope you can agree we need to explore more than just one model. And by explore I mean go visit facilities. Spend some time and talk to everyone you can. And be open minded. Be respectful. It’s a journey. Best wishes for success! I want to point out, you’re saying that others making a choice for you is fine, in Dorms and the other settings you talk about the Individual makes those choices not outside forces. You want to ignore the Stigma and the fact you’re “Choice” Community often does things that if done to any other Congregant group seeting would be considered a Violation of Civil LIberties. the Article you mention Rails against the Paternalism of the ACLU but many Congregant settings are in and of themselves Paternalistic towards the individuals who live in them. Your post describes the choices parents make for their adult children. Do you see that as the same as adults with developmental disabilities making their own choices? Second warning. The next time you talk down to another commenter, you will no longer be allowed to comment here. Pro-tip: Read the article before responding. Absolutely nowhere did I advocate for one housing model for all developmentally disabled people. Yet of course that’s immediately where you jump to in your comments. The real hypocrisy is in claiming “choice” for specific housing schemes that are actually chosen by the nondisabled family members. Who should chose for a person who does not have the capacity to make complex choices ? Someone who has that person’s best interest in mind, a stranger, a predator, a corporation, an advisory board, a legal guardian or supporter, a neighbor, – some are wise choices (by my definition) and some are not. It is a fact that capacity is a continuum and capacity may vary in one person from one event to another. I believe it is in the person’s best interest to have them make choices that they have the understanding of and capacity to choose. Decisional capacity refers to the ability to complete a specific task or make a specific decision. Often we need to consider decisional capacity when looking and medical care, financial management and independent living. This in no way means that the person who may need supports in this area is any less of a person or any less valuable than any other person. I believe that we all have decisional capacity deficits in various areas of life. I know that I do and there are times that I want and choose to have someone else make the decision. Lydia, I would like to ask you if you are parent or family member of someone with an intellectual or developmental disability? All NOS Magazine contributors, including Lydia, have developmental, intellectual and/or psychiatric disabilities. William should look in the mirror before he calls people hypocritical. You seriously want to tout these communities for choice and make out of context arguments against dorms and similar communities and use a parent choosing for their child rather than letting their child make his/her own decisions to back yourself up? Parent advocates have run amuck with advocacy efforts by playing into their own plight or assuming they need to speak for their grown kids. Look at how much The Mighty has diverged from its original purpose of pwds speaking for themselves. If we are going to focus on individual choice, and that’s what you want to talk about, railing against pwds speaking up on the grounds that parents are owed the right to make these choices is ridiculous. I’ve got a word for you to look up in response: Ableist. I think his point was more simple: namely that many large settings work just fine. And put the guardian issue aside: what if not only the parent-guardian but the person herself wants to live in an intentional community. Shouldn’t that choice be respected? College dorms rooms are different. There freedom of moverment on college campus that main issue with these intentional settings. They do not allow freedom of moverment. When you live in a dorm you can leave the resident and come back at anytime. I can go get a fast food at 10:00 pm at night at dorm. These setting don’t allow that. For a setting to be not institutional they have to pass the burrito test. If I can’t make a burrito in middle of night as midnight snack when ever I want, it a institutional setting. Also lots of these programs force resident to do manual labour like farming and kitchen work. They not allow people to work off campus. Also they don’t allow people to bring friends over outside of campus. College campus don’t do this. I was able to allow my friends hangout me anytime on campus. People with disabled should not be denied these freedoms. It complelty inaccurate to say dorms are like these setting. They most have freedom of moverment! Here’s the thing that raises a lot of our hackles — the way in which family members and actual people with disabilities are treated as interchangeable — including for the purpose of decision-making. Given the kinds of things that too many nondisabled caregivers have chosen — including for us ourselves at various points in our lives — we have more than enough reason to be wary. This is a reminder from your friendly neinorhood administrator: If you cannot interact with other people respectfully, I will delete your comments and ban you. You don’t have to agree with everything in NOS, you just have to be decent to other people. For the record: No, I don’t believe in guardianship. A guardian is NOT an actual substitute for the disabled person. Just because something is “legal” does not make it either factually true or morally permissible. I don’t understand how you don’t believe in guardianship. I am a retired scientist and the mother of a 36 year old son who was born with an agenesis of the corpus coliseum (and three other children). He is profoundly challenged. He functions at about a 1 year old level. Do you believe in guardianship for a 1 year old toddler? Can a 1 year old toddler make her own decisions? If we take issue with the “non-disabled” family member making decisions, do we take issue when that non-disabled family member also decides to place the person in a small community home? It seems as if you take issue with guardianship generally, which has nothing to do with whether the guardian then chooses a large home or a small one. It does have a lot to do with it. If a person in their own capacity doesn’t want to live in a place — and everyone has and can express preferences, even people who are written off as incompetent — it doesn’t matter what the setting is, they shouldn’t be made to live there as a “home” just because someone’s determined it’s for their own good. Our community has every reason to distrust paternalism, even — especially — those members who have at one point or another been written off as not being able to make their own decisions. I don’t understand: a guardian (usually a mom or dad) has to decide some place for their child to live, be it large or small, urban or rural, etc. That “guardian” has a duty to act in their child’s best interest. Presumably those in favor of large facilities (intentional communities) can voice the same objection you are when the parent-guardian chooses a small home in the community. Ultimately those are guardianship issues that involve a plethora of decisions, not just housing. So, you think using slurs is a good way to get people to agree with your position? How did this comment get past moderation when the R-slur was used and mental age theory was used that is very offensive to people with I/DD! Your argument is terrible and you insult us with those words Jean! We not mentally children! If you don’t believe in guardianship, how are decisions made for people who may not have the capacity to make informed decisions? With guardianship there is accountability and many safeguards in place so that a person is not subject to predators and abuse. There are many tools available for assessing a person’s capacity for consent – these are used in many situations dealing with healthcare, independent living, financial management and other elements related to daily functioning . Guardianship isn’t the only option. I don’t usually comment, but I want to share this awesome resource from the Autistic Self Advocacy Network. The best part is that it has an image supported, easy read version to help people with intellectual disabilities read along with their families. That’s not to say that it works for everyone, but I think there isn’t a lot of awareness of alternatives to guardianship. What happened to William’s comments and the short video he posted? I banned William for being disrespectful to other commenters after multiple warnings. He then proceeded to insult me personally. Also I thought William’s comments were actually good. Yes, they were provocative, but they made you think and examine assumptions. A lively chat is healthy. Otherwise places like this are just mostly echo chambers. Thank you. There’s a difference between being provocative in the sense of intellectually challenging and being belligerent and condescending, which is the conduct being complained of. Parents whose kids are thriving in intentional communities might take offense saying many of the views expressed herein are “belligerent.” We should not get caught up in labels. Most parents (me included) don’t care about labels or acronymns. We just wants lots of choices for our kids. For example, NO WHERE in the report does it state that Ford is funding a community– Ford only funded the report, which is apparently ruffling feathers bc it presents a point a view which is legally relevant but has been ignored by DOJ and CMS over the past 8 years. NO WHERE in the report does it state that Ford endorses the report; rather, the views presented are those of the authors. NO WHERE does the report state that in any proposed community residents are limited to the disabled; that they cannot choose to be there or not; that they cannot come or go; that they cannot choose their roommate or even whether they would prefer to live alone; rather, the proposed community IS person centered AND consumer controlled. And yes, one could even make a burrito in the middle of the night. Under the CMS regulations, this is not an institution. I’m not going to repeat the report for people who can’t be bothered to read it (facts are so tedious in any event) before they jump to unsubstantiated conclusions. But I do encourage all people to keep their minds open and actually informed, because it serves no one to rely on outdated and misleading assumptions. If your real argument is that every person is legally competent and there should not be guardianship, don’t be disingenuous: state that up front and be clear. That is a different matter altogether. I love when people who disagree with me insist that I “read the [whatever it is I disagree with]” because they assume my disagreement means that I haven’t. Fun fact: I always read the things I criticize, in their entirety. Even when they’ve been hundreds of pages long and in dense regulatory language. You take exception to families (and residents themselves) from being allowed the choice of an intentional community like the Delaware one. If the model is so bad, nobody will want it, or they will move out. As a mother with a severely disabled child, I don’t get this debate. I want choices. All sorts of choices: big, small, rural, city, etc. I don’t care what the acronym is. I applaud Ford Foundation for bucking the trend. Plus, Olmstead does not require anyone to move from large facilities who want them. No. If the model is bad, the powers that be–parents, guardians, caregivers, the state–will still think it’s good, and will force, coerce, or convince disabled people to move in and stay. How do you think institutions have survived up until now? How do you think abusive and neglectful nursing homes continue to operate? situations for disabled people. Many of us grow up believing that we need to be controlled and that we’ll never be able to live or operate independently. We often aren’t made fully aware of our options and their benefits. I was lucky enough to have a parent who pushed back against all that, but not everyone is so lucky. Who says it’s “harmful”? You? You decide for the rest of us? What if I thought all small community homes were “harmful”? Ultimately if there are a plethora of choices people — residents and guardians — will vote with their feet. As a parent I sincerely don’t understand the reticence (if not hostility) in even considering an intentional community. How is this “pro-choice” by banning an entire housing option? How can anyone watch that video and say the residents are coerced? Places like this have long waiting lists for a good reason: because they provide an amazing life for these residents. There is nothing wrong with this choice. In fact I am flying down there to now check it out for my daughter. By the looks of it, it would be wonderful for her. For some reason, there’s no “reply” button on the two replies to my last comment. So I’ll reply here. The difference isn’t between large facilities and small community homes. We have no problem with a hypothetical intentional community that is fully controlled by its actual residents–not parents, not guardians, not caregivers, but the disabled people living there. We have lots of problems with any facility–a small home, an intentional community, a mental hospital–controlled by non-disabled people. Any such facility is ripe for abuse, either obvious or more subtle. That’s simply how power works. It is human nature for those in power to abuse those who lack power, whether they realize it or not. Truly consumer-controlled options are rare in the U.S. So by making them the norm, we want to expand choice, not restrict it. As to the video, do you really expect us to accept the ranch’s promotional material at face value? You’re showing us the highlight reel. How do we know what goes on in the outtakes, behind closed doors? There may or may not be abuse of some sort there, but one advertisement doesn’t provide much reassurance. Also, you both missed the first point I made in my last comment–just because something is a bad option, doesn’t mean it will close. Individuals in positions of authority over disabled people will think it’s a good option, will ignore, justify or not notice the abuse, and the bad option will continue operating. Residents often aren’t allowed to vote with their feet. Before commenting further, I suggest everyone in this exchange read Mel Baggs’ blog post about institutions (referenced in the article.) Mel Baggs is a nonspeaking autistic person, with many traits you might recognize in your own children. Mel also spent time at one of these glorified institutions, and offers a compelling explanation of why they are abusive and harmful even if they don’t involve overt physical abuse. They funded the report. There is no clearer endorsement of something than throwing money at it. Of course not. What decent project developer would brag about all the ways their proposed project stinks? But this bears all the signs of an institution by any other name. The report was written almost entirely by family members of autistic people, without even a single, token discernible actually disabled person on the list. One of the authors is the ideologue Amy S.F. Lutz, known for her hit job on the neurodiversity movement in Slate a few years ago. The report itself refers to Autistic self-advocates as “inclusion zealots.” It is riddled with testimonials written by parents of disabled adults, rather than disabled people themselves. It claims that the community’s services will be consumer-controlled, but offers absolutely no plan for ensuring that that actually happens. How do we know that “consumers” in this case won’t mean the disabled people’s families, rather than the disabled people themselves? Given everything else I’ve just described, I’d be willing to bet that’s how it will play out. This project may or may not fit the CMS definition of an institution. That’s not the only viable definition of an institution. Lydia hasn’t written a legal brief here; they’ve written an opinion piece. organization supposedly dedicated to social change–ought to be funding. Just because something implicates the extent to which guardianship should or shouldn’t extend doesn’t mean that has to be the whole argument. It’s relevant to say that the idea of an intentional community is likely to be misleading when (by the admission of many of the commenters here) it’s the family’s wishes and choices that are relevant and in fact seen as interchangeable with the service recipients’, without having to focus on guardianship. There’s also the matter of theory vs. practice — which has always been an issue when it comes to institutionalization/congregate care. The way in which institutionalization, even (and especially) in the ones that pose or are viewed as the “good” institutions, plays out is why actually disabled activists have so long rejected it. If there is freedom of moverment why there locks that resident can’t unlock? Why parent who promote making number coded locks on their doors to make so their autistic Child can’t leave when there chose want them to be in this setting. parent admits these places don’t have freedom of moverment. can people have a boyfriend or girl friend relationship on these setting? Can they truely request to have food when they want it. I don’t see anything in ford report starting how these places have freedom of moverment. I see lots of restrictions and that is what makes it a institution. Shain is right to say lots of these places are in place where there no way to access community with out caregivers take them in car. That is a problem do resident only get go to community if they in group? I see lots of that. In reading the article you referenced, I see absolutely no validity to your comment. There are extreme circumstances and many checkpoints along the route to even consider ECT for people who have failed every other alternative available. Reading the article actually provided hope for some of these people and their families that they may have an improved quality of life.